The 2018 Dodge Journey is designed from the ground up for style and performance, and with the different package options, you can tailor the Journey to your own style. But what makes the Journey such a popular mid-size SUV? The available Blacktop package adds a sense of mystery to the Journey. 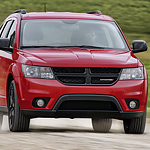 The gloss black grille and lower fascia of the Dodge Journey gives it a distinctive front profile. Add in the black headlight accents and glossy black exterior mirrors, and you have a truly unique style while driving down the road. When selecting this package, you can find it on the SE, SXT, and GT so that you have the right Journey for your needs. Come to visit our team at Porterville Chrysler Jeep Dodge, where we can answer your questions and get a 2018 Dodge Journey ready for a test drive.